50% of homes already snapped up at our Yate development Attracted by thoughtful design and a quality finish, homebuyers looking for a new property in Yate have already snapped up half of the properties on our Amberley development. 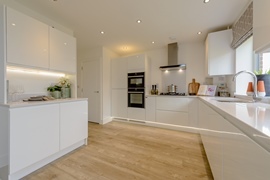 Over 80% of homes already sold at our Brooklands development in Evesham Homebuyers looking for the ease of a new home in Evesham, together with a choice of well-designed properties, have already bought over 80% of homes at our Brooklands development. Our award-winning Swindon development hosts two weekends to make a move upwards easier Our Broad Blunsdon Heights development has been awarded the title of Best New Large Housing Development in Swindon Borough Council’s Local Building Excellence Awards 2019. Three bedroom homes released at New Town Park, Toddington We have released a selection of three bedroom homes at our sought-after New Town Park development in Toddington. This weekend (16/17 February), we are inviting home-hunters to come and fall in love with our Twyning Green development at our open weekend in Twyning, near Tewkesbury in Gloucestershire.